It has to be agreed that saving the planet isn’t easy. Those that are inclined to recognize the problems that us crazy humans are cooking up for ourselves, and then actually try to help solve them know full well, it’s a big job to say the least. People who want to save the environment by living in harmony with it appreciate that life is a series of choices. Our collection of decisions are what control the future and a good example of these decisions hits us in the face every time we get hungry. We should eat sustainably, but are there any options for this in modern life outside of a meat free diet? The answer is yes, on our doorstep there is one kind of fish in particular which is truly sustainable, and more so, for every one you eat, you actually help the environment. The fish in question is the invasive lionfish that lives in the waters of the western Atlantic. Though the term “invasive” conjures up an image of a war mongering tribe launching an attack, the reality is quite the opposite. 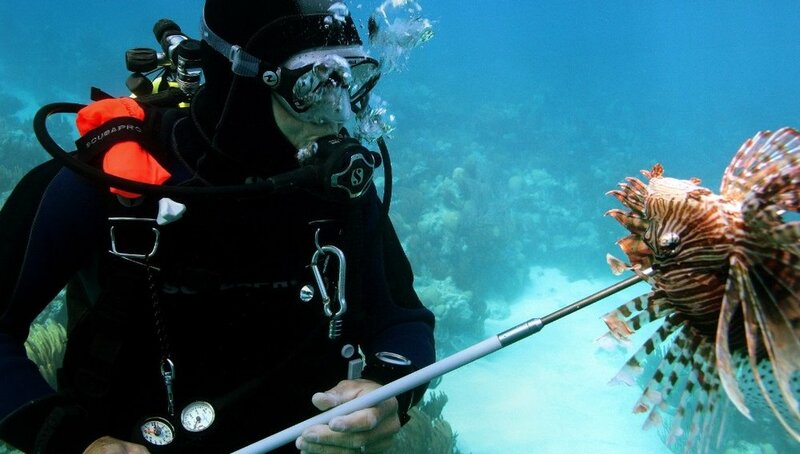 Lionfish were introduced to the sea in Florida in the mid 80’s by careless humans. The most commonly accepted theory behind this is that aquarium owners who no longer wanted their lionfish, opted to release them into the ocean as opposed to disposing of them any other way. The issue with lionfish is that they have no natural predators in their new habitat. Coupled with the fact they are rampant breeders and eaters, what we have here is a fish that disrupts the complex food chain by eating local fish populations to excess. In addition to devouring smaller fish and shrimp, lionfish consume stocks of larger endangered species like Nassau groupers while they are still juveniles. The lionfish population has spread at an alarming rate and has been described by the National Oceanic Atmospheric Administration (NOAA) as the biggest single threat to tropical reefs this century. In areas where their population has gone uncontrolled, lionfish can be found blanketing the ocean floor, even in areas like the Cayman Islands it is sometimes possible to find clumps of 10 or 15 lionfish in one small area and no other fish around them. • Those inclined can grab a spear and go out there to battle the venomous pest on the reef. In the Cayman Islands, you need to be certified to do so which you can do through Divetech (next door to VIVO). • Restaurants can help create the demand for the meat by putting lionfish dishes on the menu. • Here’s my favourite, if you want to be a part of this but don’t want the risk of culling or setting up a restaurant then all you have to do is enjoy some of the exquisite lionfish dishes on offer. By ordering lionfish off the menu you are using your dollar to create a demand to remove a destructive fish from local ecosystems. The short answer is no one knows yet. We have learnt from other ecological disasters that introducing one foreign species to regulate another is a bad idea. Scientists are currently working on a robot that can apparently find lionfish and shoot them with a laser, however, critics argue that this idea is impractical, costly, time consuming and at the end of the day not effective. Local dive communities tried shooting lionfish and then feeding them to predators to help them get the taste for the newcomer, but apart from putting marine life and divers at risk, it just didn’t work. The conclusion to this disaster is yet to unfold, but in the meantime, the only tried and tested method of controlling the lionfish in the Caribbean is for divers to go into the water and shoot them with spears. That’s easy to say but these guys pack a mean venom in their various spines and careless actions while diving to the depths of the sea to catch the little rascals can result in serious injury to the hunter. The silver lining to this problem is that once the venomous spines have been removed, not only is the fish good to eat, it tastes incredible! Working with lionfish is not easy. The time, risk and effort in catching them does not make them financially viable for commercial fishermen to work with. As such, the fish that are enjoyed in participating restaurants have been caught by concerned members of the local community who sometimes earn enough to cover the costs of their efforts. Sourcing them is hard and once in the kitchen, the fish require lots of attention to yield a small amount of meat. Offering lionfish is a challenge but one that VIVO are proud to have accepted. Not only do VIVO strive to offer delicious lionfish dishes, we also privilege to buy locally sourced lionfish to prevent wasted food miles through importation. Like everything on our menu, a great deal of thought and passion has gone into the preparation of our lionfish dishes. We are happy to put in the extra effort that is required to help people make the decisions that result in a better future. We hope you enjoy the taste of a truly sustainable, environmentally friendly food cooked to perfection. Would you like to know more about lionfish?